With the fight between his two sons no longer threatening to destroy the kingdom, King Karikala of Sindhura finally passes away, leaving Rajendra as ruler. The terms of their alliance fulfilled, Arslan and the Parsian army depart Sindhura with a small force of Sindhuran cavalry to assist them in their war against Lusitania. 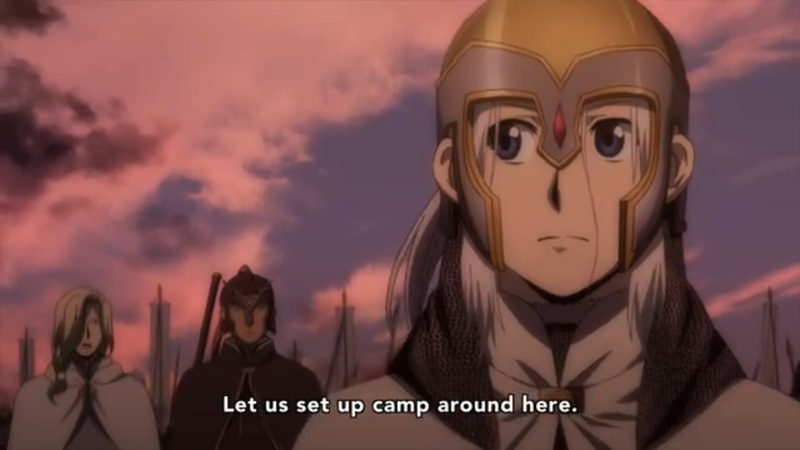 These cavalry are not a gift, however, but a trap, as Rajendra plans to destroy the Parsian army with them and capture Arslan. Fortunately, Narsus sees through this ploy, Rajendra (who arrived to lead this sneak attack personally) is captured once again, and Pars is able to extract a three-year nonaggression treaty with Sindhura in exchange for letting him go. 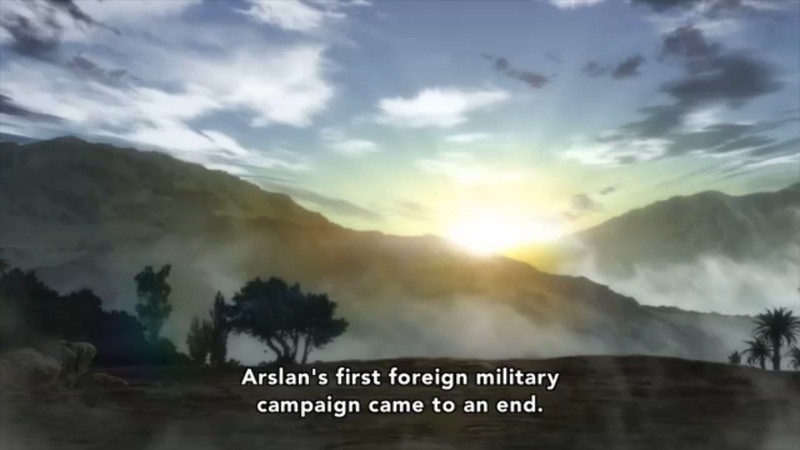 In the end, the only thing Arslan seems to have gained from this campaign is that treaty, and the loyalty of Jaswant, who swears to serve him. Well, this is it, folks. The end of the dream. 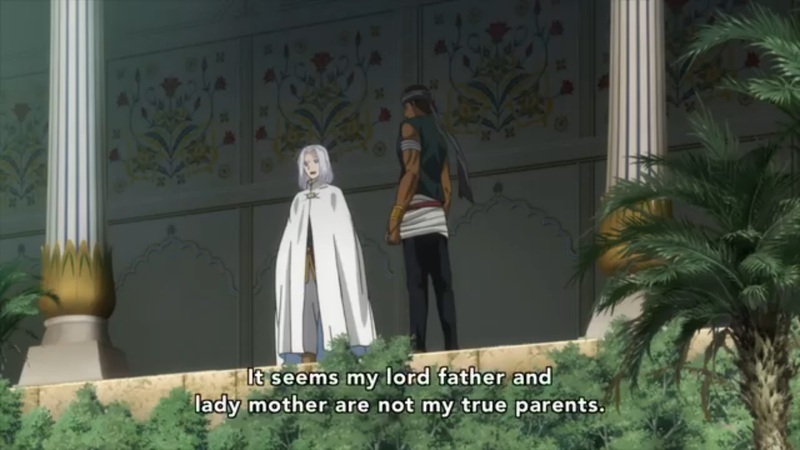 With this episode, I’m now convinced that Arslan will never become a capable leader or warrior. Let’s dig in to the latest episode of The Heroic Legend of Narsus to see why. 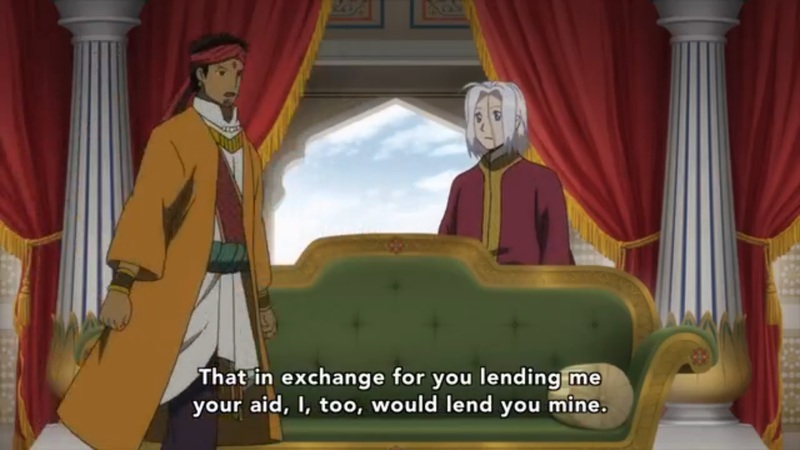 At a point during the episode, Rajendra and Arslan are having a chat about Arslan’s future plans. 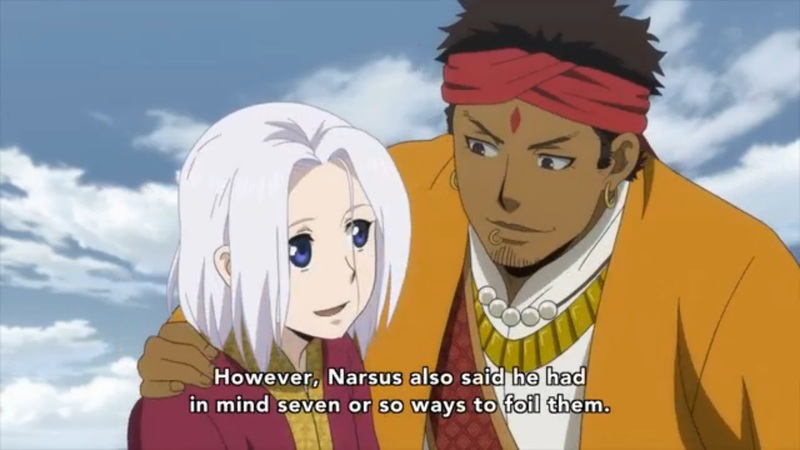 Right off the bat, Arslan lets Rajendra know that Narsus is already thinking up ways to counter the aggression of their other neighbors. Of course he has seven different ways of doing this. Finally, though, we get to the meat of the discussion – what will Pars get out of this alliance, after spending all this time and the lives of their troops to help Rajendra? Five hundred soldiers? Five HUNDRED? Sindhura has an army that numbers in the hundreds of thousands! So, incidentally, does Lusitania. What difference is this possibly going to make? Maybe if they were 500 war elephants or something. 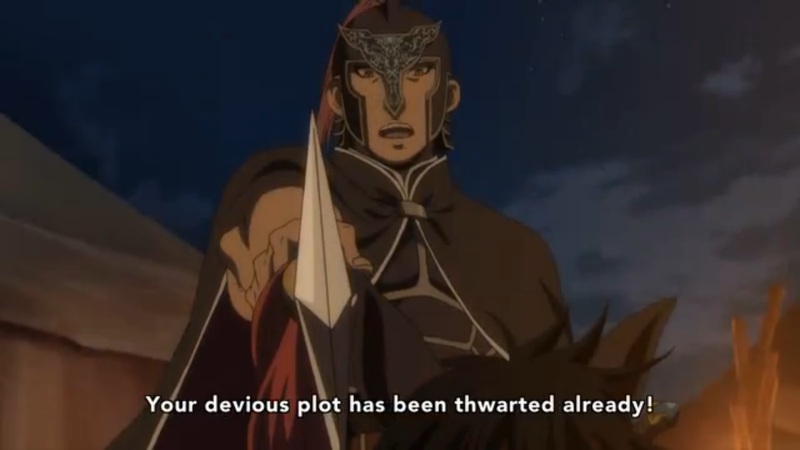 But then, just for an instant, it looked like Arslan was going to pull something off, to be clever, to have learned something from this long campaign and from analyzing Rajendra’s character. 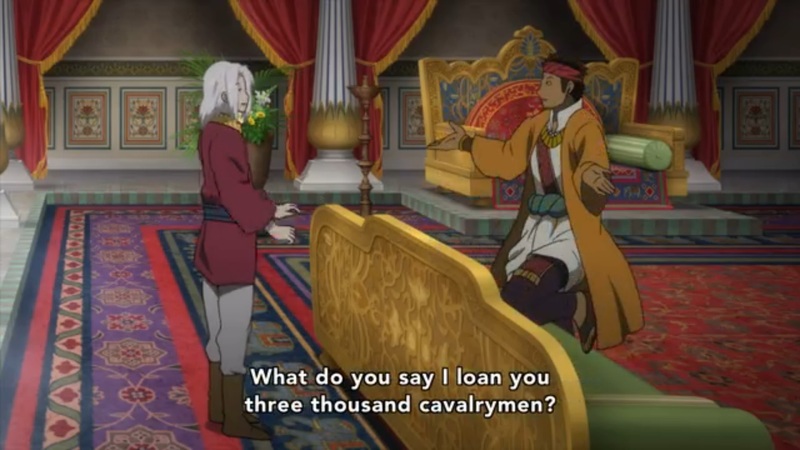 Rajendra, seemingly insulted by a request for so few troops, insisted on Arslan taking 3,000 cavalry instead. And I thought “Yes! 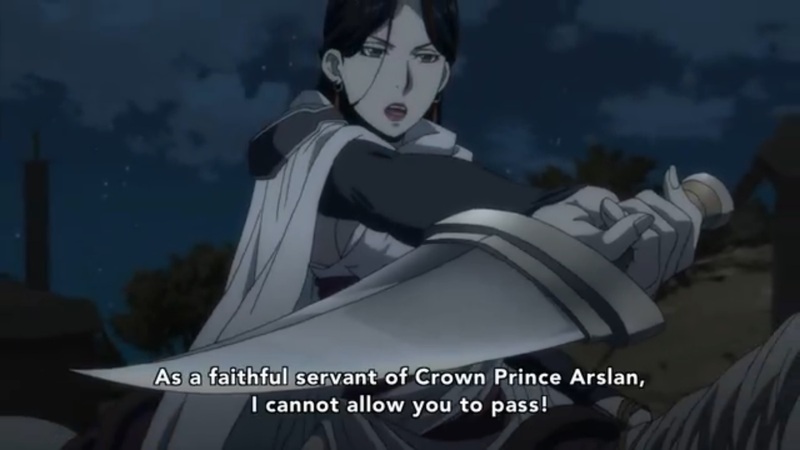 Finally, we’re seeing something from Arslan, some cleverness and guile hiding behind his gentle, friendly demeanor!” But no. My hopes were immediately dashed. 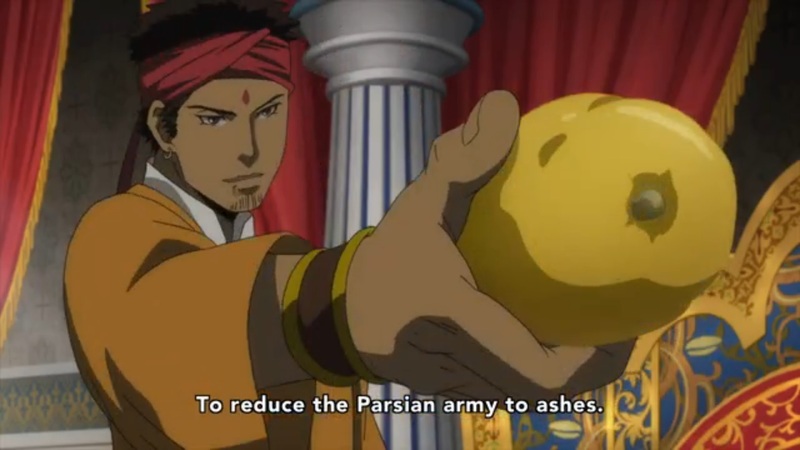 It was all a ploy by Rajendra to have enough troops nearby to destroy Pars’ army, and Arslan completely fell for it. Careful where you aim that thing, buddy, someone might get hurt. Of course, Rajendra’s plan is almost immediately foiled, his men killed, and him captured. 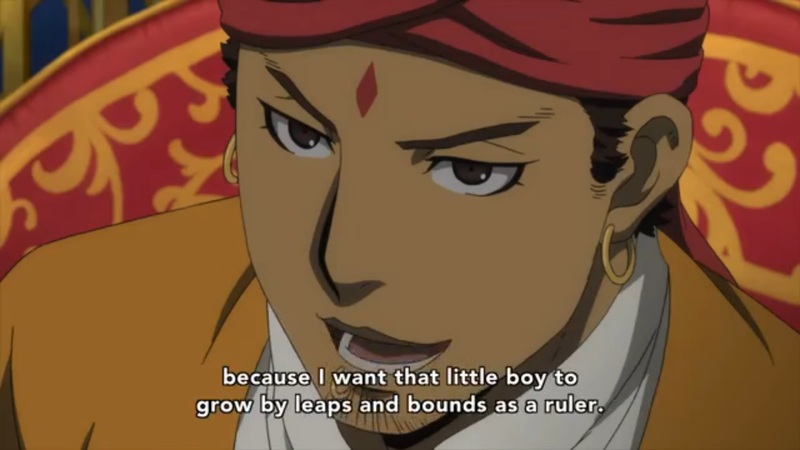 Was it Arslan that saw this coming? That finally outmaneuvered a foe? Want to take a wild guess? Really? Narsus has to tell you when it’s time to make camp? Have you ever made a decision in your entire time “leading” this army? …and defended against harm by his talented group. Another deadly projectile deflected by my loyal companions! I shall never have to lift my arms to fight again. 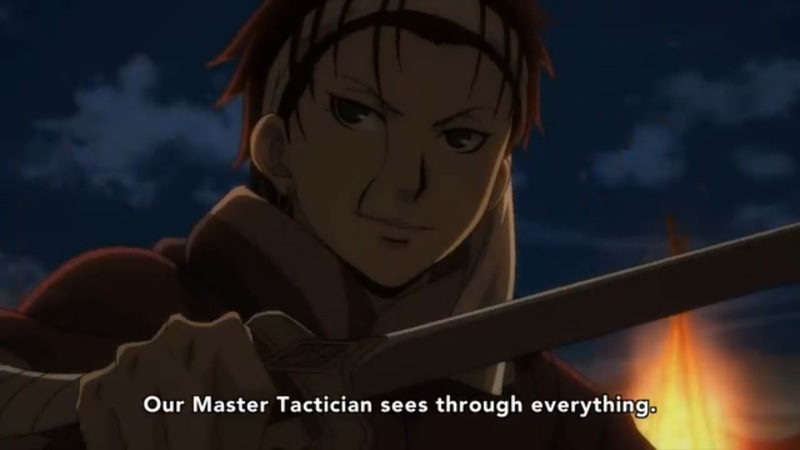 Arslan’s role, meanwhile, seems more and more to be gathering individuals to his cause. 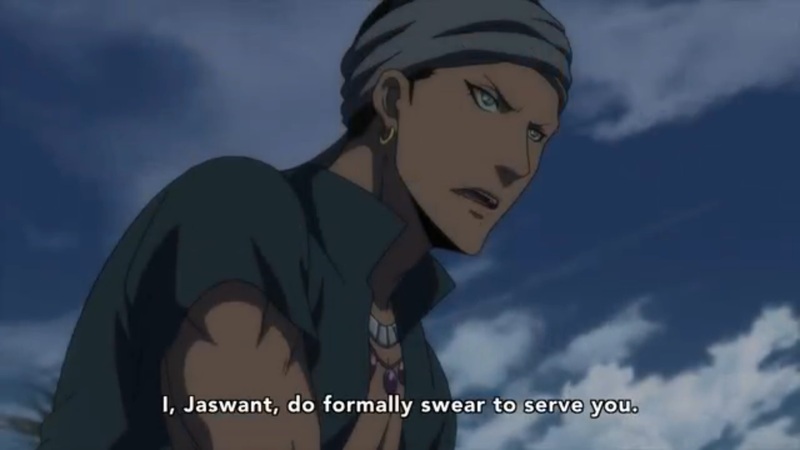 This episode, his four episode courtship of Jaswant finally bears fruit. 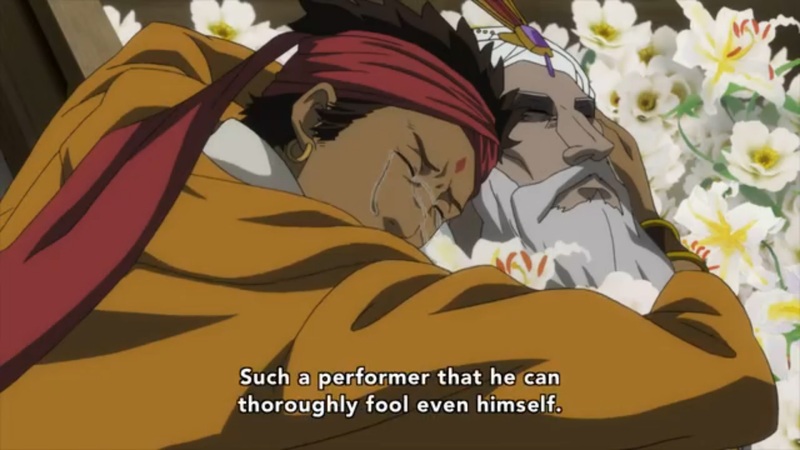 Arslan bares his most closely kept secret to Jaswant in an attempt to win him over. Just gonna let anybody know about that, huh? 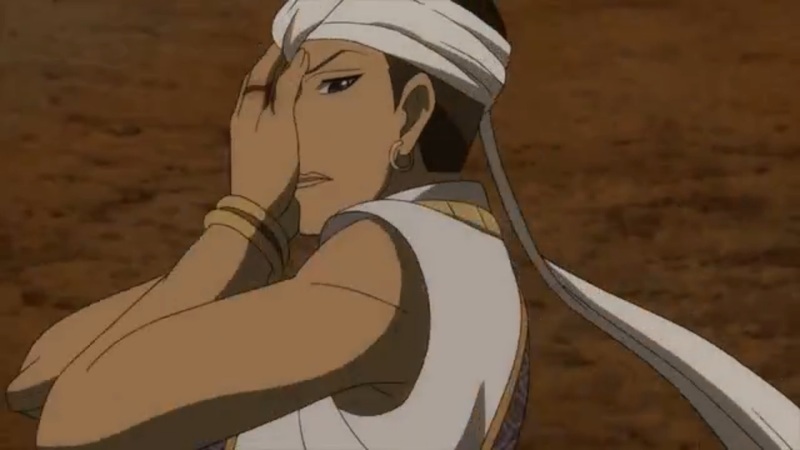 Arslan’s friendly nature and repeated kindness to Jaswant win him over at last, and another member is added to the team. And so I guess this is how the show is going to work now. 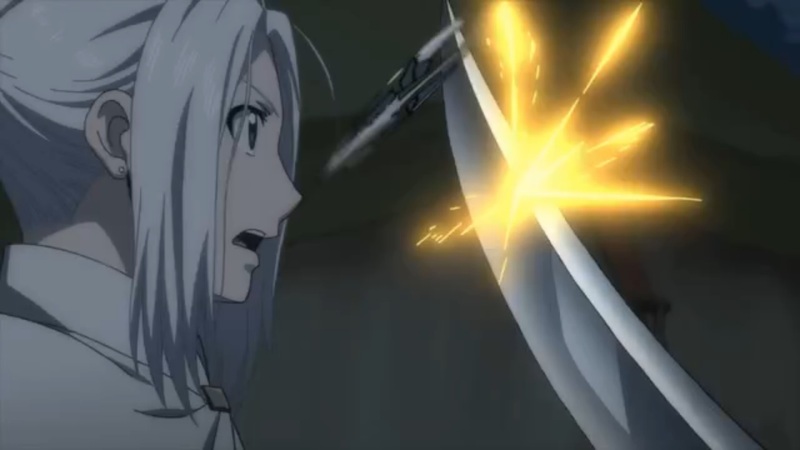 Arslan’s purpose in the show instead is to use his gentle nature to attract highly skilled individuals to his cause, and no more. He is a rallying figure, not a leader. His companions, meanwhile, will keep him safe and his enemies defeated. 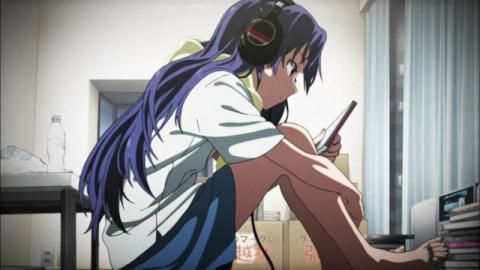 It’s not a bad format for a show, exactly, but it does feel somewhat unsatisfying to watch the (ostensibly) main character succeed against all odds simply by having a better team around him than by any skill of his own. 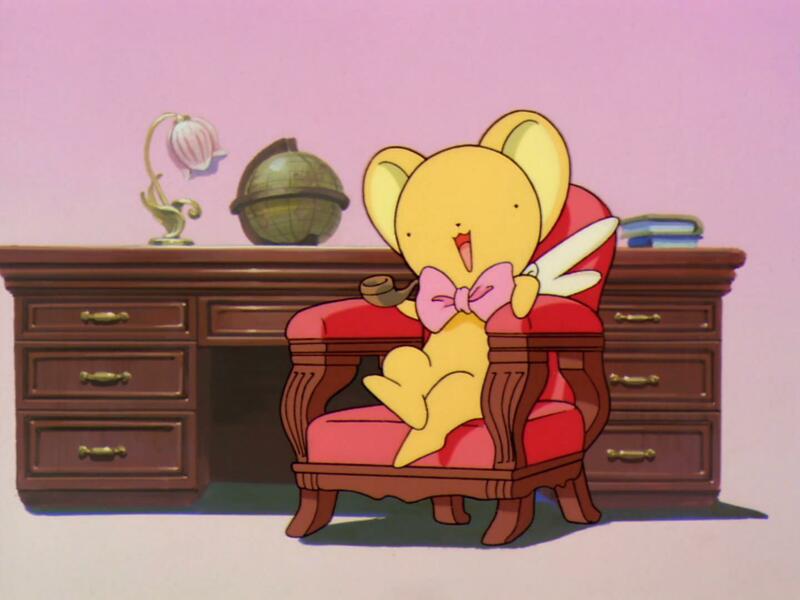 The episode is not without its merits, though. We learn a lot about Rajendra’s character now that he’s in power, and he’s a much more interesting person than he seemed at first. 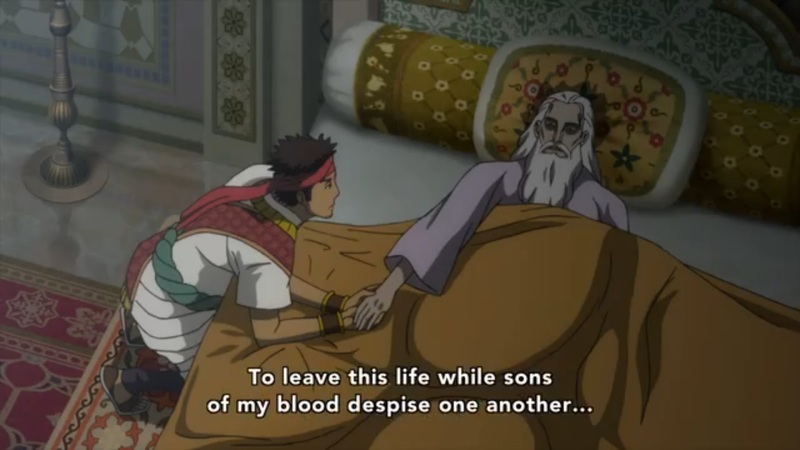 He grants his father’s dying wish to spare Gadevi’s life. Almost immediately after the King dies, though, he holds a special banquet for Gadevi, a tradition before royalty is executed. 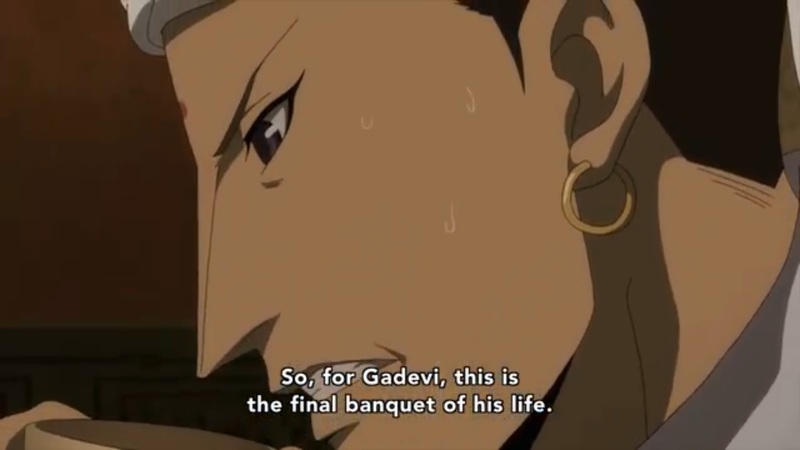 And, after toying with Gadevi for awhile, he does indeed have him killed. 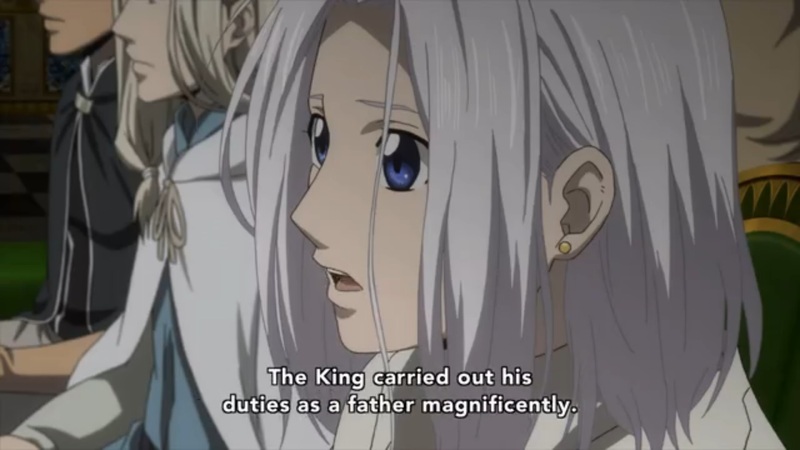 Then he manipulates Arslan as described above to try and destroy the Parsian army, though he seems to do it at least partially out of a twisted desire to see Arslan grow. Wow. There’s a lot here to process, and as we leave him behind, I find myself wishing we had more time with Rajendra. He is brutal and quick to establish himself as ruler once he has the chance, and immediately attempts to weaken his potential foes. He’s shrewd, calculating, and devious, as well as overambitious, but always has on a smiling face and can get quite emotional. There’s a lot going on with him, in short. I do have some other minor quibbles with the episode. For one thing, the animation quality really took a dive. I think they blew the budget on last episode’s big fight, because in this one, there isn’t a lot of movement, and what movement there is looks wooden and robotic. Beep boop, Rajendra-bot 3000 will move towards couch. Several other scenes also stand out to me, like when Farangis blocks Rajendra’s escape from his ill-fated attack. Why is your knife an enormous slab of metal? How are you holding that knife with your hand like that? If you blocked a sword hit like that, your arm would snap like a twig. Where is that scream even coming from? Why are you looking up at Arlsan as you fall sideways? It’s just such an odd scene. How would you know!? From your own experiences with your brusque, warmongering father? Or because it seemed like the right platitude to toss out there? Ah well. At least we’re done with the Sindura arc. 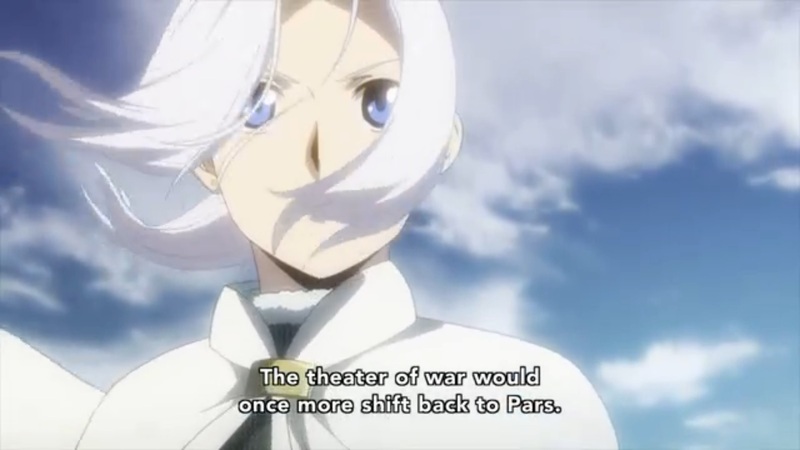 And so at last we return to Arslan’s attempts to free Pars from Lusitania. 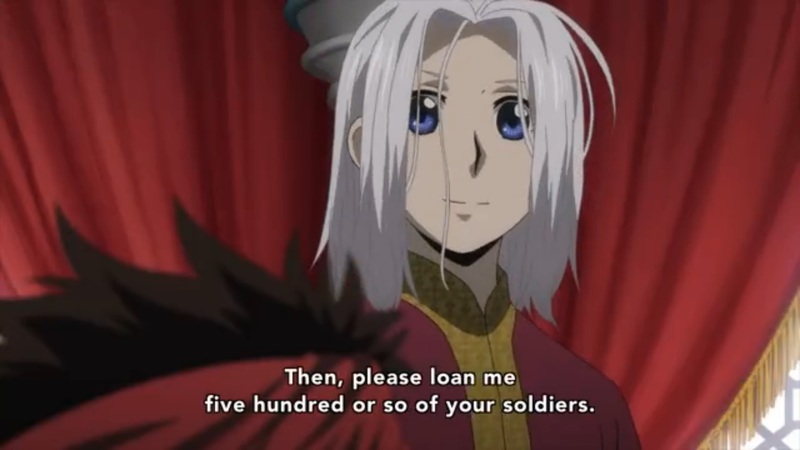 If I were one of Arslan’s rank and file soldiers, though, my main thought on this foreign military adventure would be “What was the point of all that?” As a viewer, my thoughts are essentially the same.